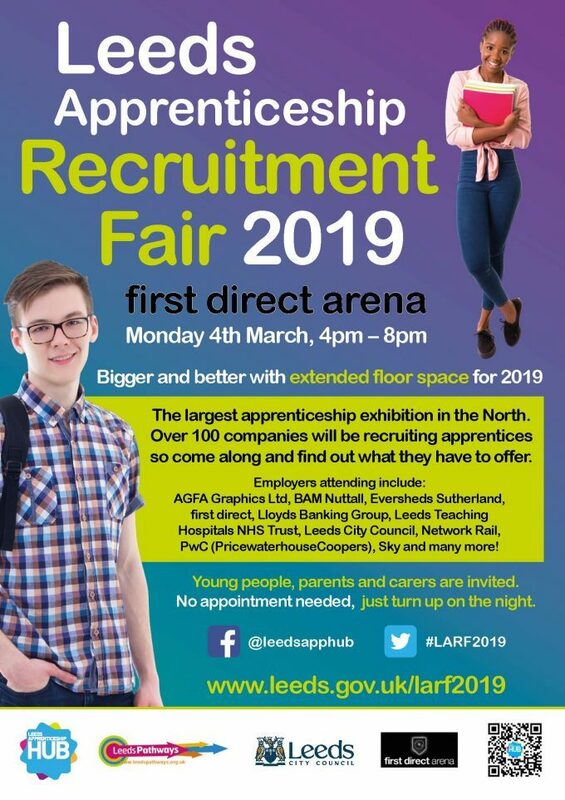 The Leeds Apprenticeship Recruitment Fair will return to Leeds’ first direct arena on Monday 4th March, from 4pm-8pm. Organised by Leeds City Council’s Apprenticeship Hub, the fair is now established as the largest event of its kind in the north of England! This is a fantastic opportunity for those interested in apprenticeships to meet and greet some of the UK’s biggest employers. Attending employers include: Sky, AGFA Graphics LTD, Leeds Teaching Hospitals NHS Trust, PwC and many more. Young people, parents and careers are all welcome to attend. No need to book your place…just turn up on the night!